Puppies need to start being groomed the day you bring them to your home. Once you have your new puppy you can start the process yourself by making sure to give your puppy an exam daily. Check their teeth, eyes, ears (inside and out), their potty area and make sure to hold each foot for a short time also. Make sure to brush or comb your puppy a few minutes each day also. Even if your puppy has short hair he/she still needs to be brushed daily to create healthy skin and coat. This will help make your puppy more comfortable and well behaved during their future grooming experiences. If you have questions as to which brush or comb should be used feel free to ask your breeder or the groomer you will be using. Once your puppy has received his/her second set of vaccinations he/she is old enough to get started with the professional groomer. The exact age will vary depending on breed however the younger you start the better it will be for your puppy. Do not expect a full haircut on your puppy’s first visit. The first visit should be a meet and greet with the groomer, a nail trim, ear cleaning, bath, brush out and getting used to the sound of the dryer and clippers. 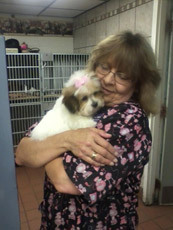 Puppies love to wiggle and have fun so we want to make their first visits to the groomer as enjoyable as possible. Once you bring a new puppy into your home the training must begin. Potty training will begin the moment you walk through the door. We recommend crate training. The puppy must be monitored when he/she is out in the house and crated when you are not able to watch the puppy. Most puppies have to potty when they wake up, after they eat or drink, after they play and after each nap. Most dogs do not like to go potty where they sleep. Remember to take your puppy outside frequently and reward your puppy when he/she does the correct behavior. Get your puppy used to wearing a buckle collar. They may scratch at it at first but if you keep up with it they will get used to the feeling quickly. Once the puppy is used to the collar you can add the leash. Just let the puppy drag the leash around until the puppy gets used to the weight of the leash. Then your puppy will be prepared to start learning to walk on a leash. At the age of 10 weeks your puppy is ready for Group Training Classes. Your puppy will need to be current on all age appropriate vaccinations. Starting your puppy right away will lead to a better behaved dog in the future. Just keep in mind that training is a lifelong activity. Puppies can begin to stay at a lodging facility after the age of 4 months. The puppy will be required to be current on all vaccinations in order to stay. 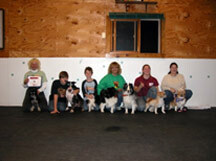 It is helpful to your puppy to let them get to know the lodging facility you plan on using. Do not wait until your dog is 5 years old to bring them in for the first time. It can be stressful for a puppy or dog to be away from their home, family and routine; if the puppy starts at a young age he/she will become used to the process and the facility and most will come to think of it as their second home and look forward to going. Our goal is to keep your pet happy and healthy while you are away. Make sure that when you bring your puppy in for lodging that you request plenty of playtime and attention for the puppy. Puppies can start daycare at 4 months of age. The puppy will be required to be current on all vaccinations in order to enter daycare. After 7 months of age the puppy must be spayed or neutered in order to remain in the group. An intact dog can cause issues in a pack, even if that dog itself doesn’t have any problems and we want to be as safe as possible. It is extremely beneficial for a puppy to be in daycare. The puppy will be around dogs of different ages, breeds, sizes, and temperaments. The puppy needs this exposure in order to become a happy, well adjusted dog with appropriate social skills. The puppy needs to see dogs of different ages in order to learn proper dog behaviors and social skills. The other dogs will actually teach the puppy how to be part of a group. By being exposed to dogs of all sizes and breeds, the puppy will be well rounded and less likely to become afraid of other dogs based on size or appearance. Having dogs of different temperaments will also help teach the puppy proper social skills in different situations and how to react to others dogs in an appropriate manner. Not every dog likes other dogs in their face, not every dogs like to play rough, not every dog likes to be chased, etc… Daycare will help your puppy to understand the difference and how to properly engage with other dogs.